13x12 Gravity Black Baseboard Register Discounts Apply ! Replace your dented existing vintage baseboard vents with these affordable and attractive gravity baseboard registers. This baseboard heat register for older homes are constructed of all steel with a durable white powder coated finish. 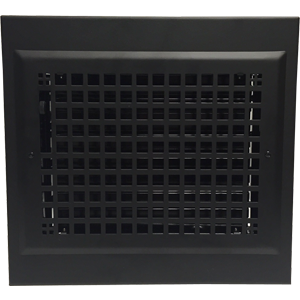 These vintage style baseboard vents are often referred to as gravity registers because they were originally used with central gravity furnaces. Although the central gravity furnaces have been removed from most homes and replaced with forced air heating and cooling, the triangular baseboard register covers often stay the same. 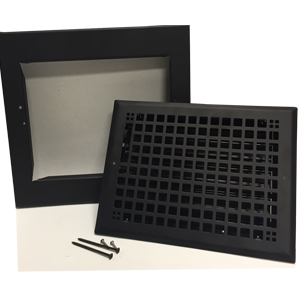 This hard-to-find gravity baseboard register comes with an adjustable multi-fin damper that can be adjusted with an easy to reach lever on the front faceplate. 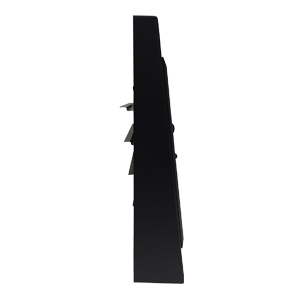 This decorative baseboard heat cover will fit a minimum duct opening size of 10" x 8". 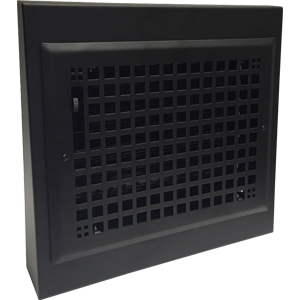 The overall gravity baseboard register faceplate size is 13" width x 12" height. This gravity baseboard diffuser style can also be found in a larger size of 15" x 12" in a white, classic finish.